We provide to our customers, the highest quality and most efficient collection service possible. This service consists of once a week household garbage collection, once a week recycling, yard waste, and bulky item collection. We are responsive to your needs and intend to go the extra step for satisfactory service. Be sure to recycle as much as you can. Recycling helps reduce the size of our landfills. Be good stewards of your city! Did you know you can recycle paper, cardboard, tin and aluminum cans? Check out our Recycling & Sustainability Center webpage for information on how you can help. Vehicle Tires five per household at a time. Tires that are on rims must be removed from the rim. NO TIRES will be collected from any commercial establishment. NO TIRES will be collected that have rims. The only tires acceptable are passenger car or light truck tires. These tires are recycled. Paints these items must be solidified before collection. You can mix them with sand or kitty litter. Carpet The garbage trucks pick up only small pieces of carpet/rugs. The grab-all will pick up large rolls of carpet on the bulky/yard waste collection day. Lancers, needles, and syringes should be containerized in a hard plastic or metal container with a secure lid. You must call for collection. Electronics We do recycle electronics. You may put electronics out with your regular garbage or recycle at one of the drop off sites listed below. Anti-Freeze May be collected if in original jug it came in and can only be mixed with water. Grease Columbus Water Works has 8 locations to recycled grease. We have three drop off sites for electronics. The drop off sites are the recycling drop off site on Victory Dr., the drop off site on Sacerdote Lane, and in front of the new Recycling Center. Read more information on what we pickup. Any construction or demolition materials resulting from construction, remodeling or razing of buildings, structures or pavement. This includes bricks, stone, cement chunks, cement blocks, sand or gravel. Any type of cylinders, such as propane, oxygen, chlorine, etc. Any vehicle, marine, motorcycle, or lawn tractor batteries. Any drum that contained fuel, oil, solvent, automotive fluids or pool chemicals. NO HAZARDOUS WASTE IS PICKED UP ! and most other household hazardous waste not listed.. If a lane change under paragraph (1) of this subsection would be impossible, prohibited by law, or unsafe, reduce the speed of the motor vehicle to a reasonable and proper speed for the existing road and traffic conditions, which speed shall be at least ten miles per hour less than the posted speed limit or 25 miles per hour, whichever is more, and be prepared to stop. Violation of subsection (2) of this Code section shall be punished by a fine of not more than $250.00." Residential Fee - $17 per month. 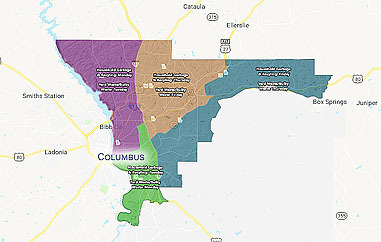 An offset of 25% per month, rounded to the nearest dime is available for low-income household collection service at the curb or on the city right-of-way. The guidelines for this adjustment will be changed annually according to the Federal Register. Two 32-gallon container at curbside is $240 annually ($120 per additional container) . Two 32-gallon container Off the Right-of-Way is $178 annually ($180 per additional container). We constantly strive to improve our service, and as a result, our normal pick up time may change. We may come by your home earlier than you expect us. If we miss your waste collection because it has not been put out when we come through your area, please note the new time and place your waste at the curb earlier. In an effort to improve efficiency, we will not be able to return to collect waste that was placed on the street after we passed through the area. Your help in getting all waste collected in an efficient manner is greatly appreciated. 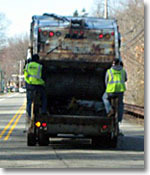 Household garbage is collected once a week. Garbage containers should be placed at curbside before delivery time on collection day. If for some reason we miss your can, and it is our fault, please call the Citizens Service Center at 706.653.4000. Leaves, grass clippings, pine needles and similar yard waste items are collected once a week. Yard waste must be containerized in a container or bags and should be placed at curbside on or before the collection day. All yard waste must be free of any type of household garbage. Bulky Items consist of large household appliances, water heaters and bulky furniture that cannot be collected by the regular garbage truck. Bulky items are collected once per week on the same day as yard waste. Tree and shrub trimmings from pruning will be collected once a week, the same day as yard waste. Special instructions for the collection and disposal of trees cut on private property. Tree Collection is NOT a part of our normal Solid Waste Collection Services! If you would like for the City to collect and dispose of the Tree(s) set out, please call Citizens Service Center 706.653.4000 and request a "Tree For Fee" Pick Up. The tree(s) and associated debris will be picked up for a $50 collection fee per load, plus a current tipping fee per ton. Consult the website for Granite Bluff Landfill for current tipping fee costs. You will be billed separately for this service, and please allow one week for services, from the time the request is made. If you elect NOT to have the City collect the tree and associated debris, please have the trees removed within ten days of receipt of notice. Please Note: If you now pay a reduced garbage fee, this charge will be reduced by the same percentage. There has been quite a bit of confusion over the years about whether landscaping firms and other contractors must remove their waste from the residential customer's premises or whether the waste can be placed at the curb on the regular trash pickup day. City Ordinance 13-167.2(8) states "All nurseries, landscape gardening firms, clearing, grading and building contractors, and logging and pulpwood related operations shall remove all solid waste which they accumulate through their work." If you have a contract firm working on your yard, please make sure that they remove their waste in accordance with the law. Thank you for your cooperation and assistance in this matter. 602 11th Ave. Bldg E.